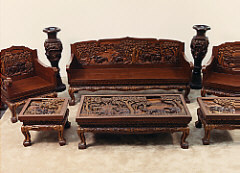 All of this furniture is solid hand carved wood and was brought to the United States in the late 1960’s!! It was all made by one Vietnamese man as a hobby in a hut in Vietnam. He died before he completed the Bedroom Suite’s Dresser, Chest and Mirror. 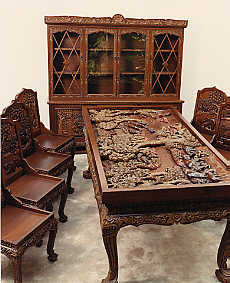 It is unknown as to exactly how old this furniture is or how long it took him to make it. There are no 2 pieces carved exactly the same, including the 8 Dining Room Chairs in which no two backs or fronts are alike! This is a truly “One of a kind” group of furniture! 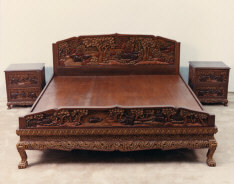 It could be called “Antique Hand Carved” because it’s all more than 33 years old and is in very good condition. The End Tables, Coffee Table and Dining Table can be fitted with glass tops to the appropriate size, to your liking. The Dining Room Chairs and Living Room Chairs can be fitted with cushions to your liking. The King Size Bed will require a king size mattress. 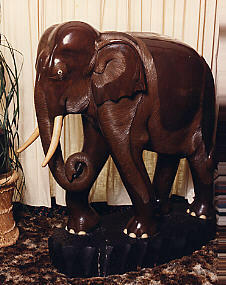 The Elephant is carved to perfection from a single tree stump and weighs approximately 400 pounds! The depth and expertise of the carvings are outstanding. Some pieces have minor cracks and/or blemishes on the finish, which is a trademark of solid wood, but overall this furniture is in excellent condition! Please - only serious buyers. 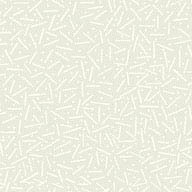 E-mail Us for an appointment to view the entire collection.